I have struggled with my weight most of my life. I was always around 140 lbs. in high school and after I graduated I was married and had a baby. When I delivered my daughter I was about 220 lbs. I was wanting to have the bariatric surgery, I did not have the funds to afford it. I have tried every diet possible, but an opportunity came where I was fortunate enough to have the funds to have the procedure. I started researching on what procedure to have and because I am a registered nurse who works in surgery, I was able to understand the different surgeries. The one that seemed to fit me was the vertical gastric sleeve. Next, was where to have it done. I had looked at a local hospital who had a great reputation for bariatric surgeries, but it was going to cost $15,000. I had extra money but not that much so I started researching going to Mexico. I had had several friends that had gone to different parts of Mexico for surgery and they had good experiences. 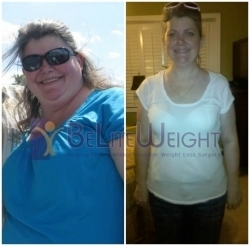 I contacted several different companies for the weight loss surgery. The first one to contact me was BeliteWeight. My patient facilitator contacted me by email and told her of my dilemma. She sent me all kinds of information about the doctor and a list of people who had had surgery in Mexico. I decided to go to Juarez, Mexico to have the surgery in March 2011 and my journey began! I flew into El Paso, Texas and BeliteWeight picked me up and took me to the hospital. As soon as I got in the room everyone came in and started getting me ready. The anesthesiologist, Dr. Leticia Solis, came and introduced herself. She was very compassionate. She came and sat by me held my hand and told all that was going to happen. Afterwards, I was taken down to surgery which was only about 30 minutes long! After surgery, everything went well. The first day there was a lot of gas pain, but nurses were very considerate and took very good care of me. Dr. Jose Rodriguez and Dr. Elmo Aramburo were very attentive, they came by everyday. The whole time I felt very safe. My family was very worried about being kidnapped by drug dealers. I was confident in my safety. The whole group worked very hard to make you feel safe from the driver in the car to the hospital staff. There were guards in the lobby of the hospital at all times. As of May 22, 2011 I have lost 46 lbs.!!! * The thing about losing weight to me is it is a mind game. When you get to that point that you decide that surgery is the only way then that is half the battle. As for me I am very conscious of what I eat and how much. The only snag I have found is that eating at work is very difficult. Like I said I work in surgery so I can't eat whenever I want to. The people I work with are very supportive and helpful. They give me breaks if possible to get a sensible snack. I carry my lunch now and make sure I have enough for the day. I would recommend BeliteWeight to anyone. I have told people great things about this group and hope everyone has great success like I have had!!!! !